Maybe it is just me, but there is something ultimately terrifying about the vulnerability of a group of humans on board a spaceship, in cryosleep, and unable to see a threat let alone fight it off. That is what happens in this early-ish Tom Baker story that sees The Doctor, Harry and Sarah-Jayne arrive on a ship called The Ark. It is a very fitting name because the humans aboard the ship are there to sleep out an Earth parched by a massive solar flare. They have overslept by a couple of thousand years prompting The Daily Mail to complain about lazy science types too busy sleeping to cure cancer… no sorry. But something has beaten them to it. A giant insect known as a Wirrn has arrived and started taking over the suspended humans by laying eggs inside the human bodies. The crew then, were slowly turning into these Wirrn and of course it is down to The Doctor and his companions to prevent it happening and allow humanity to repopulate the Earth. By far and away the best story of the Pertwee era, it was the final story to be broadcast in seven episodes (after this it would be four or six episode stories). It was also the final episode with Caroline John as Liz Shaw. The TARDIS has been dismantled and at a secret research project on Salisbury Plain, Professor Stahlman is seeking to penetrate through the Earth’s crust to reach a new type of gas he’d previously detected. He believed it would be a more efficient fossil fuel. As the drill penetrates through the crust, a green goo seeps up and one of the drill engineers is infected – he would slowly turn into a primordial caveman type thing. Sensing the danger, The Doctor makes a run for it and ends up in an alternate universe Britain which has become a fascist regime. They are involved in a similar programme but theirs is far more advanced. Earthquakes are being reported all over the globe. The Doctor realises what is happening and tries to stop alternate versions of Liz and The Brigadier from making a stupid mistake. They pay no attention and soon they are all infected with the green goo. 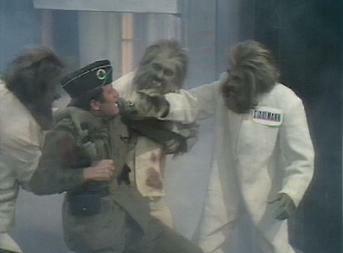 Only Evil-Liz, Evil-Brigadier and The Doctor manage to escape. Evil-Brigadier threatens the Doctor, demanding to be taken back to our world. The Doctor refuses, telling him it would create a paradox. In the scuffle, Evil-Liz shoots Evil-Brigadier and lets The Doctor escape, believing The Doctor’s explanation and resigns herself to her fate. The Doctor escapes just as that world collapses. Doctor Who has done a few haunted house tales over the years, the ambience of British television in the 1970s and 1980s made even unintentionally atmospheric television that little bit unnerving. Naturally then, Who took like a duck to water in this – one of if not the best story from McCoy’s era. Ace had been terrified by a visit to an Old creepy Victorian house as a teenager, something that affected her deeply. Curious, The Doctor decides to take her to the house – under protest – and they end up there 100 years before Ace’s visit (1883). There is a rather complex story about an alien visiting hundreds of thousands of years before and the insectoid life form went into hibernation to forcibly evolve itself into human form. When he wakes up and his ship returns, it is of course 1883 which is when The Doctor and Ace have been drawn there. 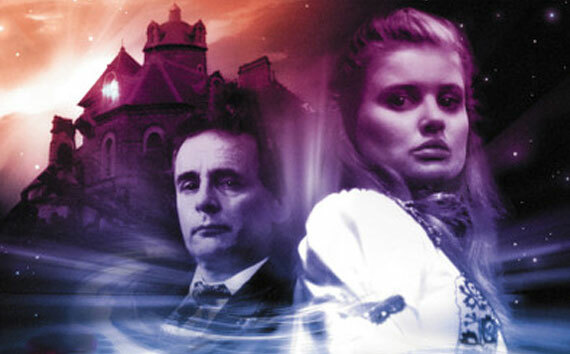 A Victorian setting is always scary – which is why it is used so often in television ghost stories. It was this presence that Ace had sensed in the house and together they set out to solve the mystery and the plot of the alien beings to overthrow the Empire and rule the world. The house, naturally, is creepy and atmospheric enough to be a good “ghost” story in its own right. Turlough – one of the most celebrated companions was one of the darkest, weirdest and most haunting of figures throughout the history of Doctor Who. In his very first story, he is being manipulated through The Key to Time by a the creature known as The Black Guardian. He wants to destroy The Doctor in revenge for his earlier defeat acquiring the artefact (Tom Baker’s era). The TARDIS gets caught in the vortex of a spaceliner that is trapped in a space bubble. Going to find the transmat device to correct it, The Doctor ends up stranded in 1983 while the TARDIS gets sent back to 1977 with Nyssa and Tegan aboard. They find a being who calls himself Mawdyrn and he manages to convince them that he is in fact The Doctor and that they need to return to the spaceliner quickly. He is an imposing figure at first and you are never sure of his intentions, though ultimately all he wants is to die in peace. This story is scary because of Mawdryn’s deception and with Turlough still under the influence of The Black Guardian at the end, there is a sense of impending doom. Terrifying really only for the insidious state of affairs from both characters and especially the fine acting of Mark Strickson (Turlough). So that’s four to start you off with. I know there’s a few Whovians amongst my subscriber base. This one’s for you – how many more can you think of? Ah I would love to join in but having only watched Doctor Who from the 7th Doctor era and hiding from it most of the time I am unqualified to comment. I know l liked what I saw of those episodes but I don’t really want to watch old stories because I struggle to hold interest in most two parters, let alone a 7 part story. That said, modern era Who I’d say ‘Midnight’ is probably the only episode that is actually scary.